Eureka spitfire 1 is a very interesting tent indeed. It’s a two pole hoop tent. The only two pole hoop tent on this list in fact. It is made for one camper and it is made for pretty extreme weather conditions. It includes a large vestibule for storage space which is actually roughly 1/3 of the size of the tent itself which is great. With 18.2 square foot of area space it is on the smaller side but after all it is only meant for one camper. Lets read the Eureka spitfire 1 review. It has a center height of 40 inches and comes with bathtub flooring with taped factory seals making it virtually waterproof, direct rain is not going to affect this bad boy whatsoever but its two pole design makes it very strong and resistant to most winds and weather types. Eureka spitfire 1 blue is small and cramped inside but it does say it is a 1 person tent. Its upfront about how tight a squeeze it is. Spitfire 1 tent is contracted entirely of no-see-um mesh which maximizes the air flow. It also has clasps that attach to the outer frame which mean it can get battered quite rigorously without it being damaged too badly. The lighter tone of the nylon on the exterior of the tent keeps the cool air in and the warm air out, which is absolutely crucial when you consider that the tent is so small in hot temperatures the person inside the tent is going to really feel the heat. This tents size mean that it should be able to withstand greater wind resistance than most tents and it really does, it tackles the issue with no problem whatsoever. Some testers have even suggested that up to 60mph winds can be deflected from it without any issue. The durability of the frame is also worth mentioning, usually two pole hoop systems blow out with ease but this one holds quite well and with additional stakes should be no problem. Eureka spitfire 1 tent is made for serious weather and for serious campers. It does not fall over easily and can be established or set up really quickly. It is designed for rugged terrain and torrential conditions by Eureka tent company. You could go exploring in this tent and be safe in the knowledge that you are going to be protected at night. Its center height is 40 inches so its standard of any other best tents when it comes to height allowances but it is very, I mean very light at under 3 lbs it is one of the lightest best 1 person tent on the market… ever! Eureka spitfire 1 has comes in a light blue/ steel color. The poles are black and it stand out nicely, it almost looks metallic and is definitely shiny. One thing that we would consider is the dirt and mud that might get onto it and would be very difficult to scrub out due to the color scheme. Spitfire 1 person tent is Light, under 3lbs, CRAZY LIGHT! Durable, lastable will not break over time. Will need additional stakes because the stock options are not strong enough. Hoop system takes longer to set up than other framed tents. 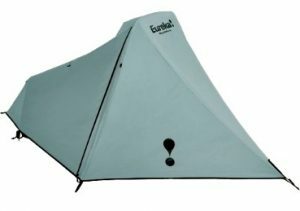 Thanks for reading Eureka Spitfire 1 Person Tent Review here. Actually it is a great one man tent for the experienced camper. You can go into any weather conditions and be safe in the knowledge that nothing is going to blow over your tent if set up correctly. It is also super light so if you are covering a lot of ground or are hiking or biking and need to have as little weight on your person at all times this thing barely weighs a thing so you aren’t going to notice it at all with the rest of your equipment.